..... Click the link for more information. . If heat continues to be supplied, the cooler fluid that flows in to replace the rising warmer fluid will also become heated and also rise. Thus, a current, called a convection current, becomes established in the fluid, with warmer, less dense fluid continually rising from the point of application of heat and cooler, denser portions of the fluid flowing outward and downward to replace the warmer fluid. In this manner, heat eventually may be transferred to the entire fluid. Convection currents are widely observed in both liquids and gases. Many aspects of weather are connected with convection currents. For example, when a portion of the atmosphere becomes heated by contact with a warm area of land, it rises into the cooler, higher altitudes, with the result that some of the moisture carried with it may be condensed to form clouds and precipitation. Convection currents have been used for heating and ventilation since ancient times. Both hot-air and hot-water heating systems use convection to transfer heat through the entire structure being heated. Convection currents also assist in the ventilation of mines. Natural convection is exemplified by the cooling of a vertical surface in a large quiescent body of air of temperature t∞. The lower-density air next to a hot vertical surface moves upward because of the buoyant force of the higher-density cool air farther away from the surface. At any arbitrary vertical location x, the actual variation of velocity u with distance y from the surface will be similar to that in illus. b, increasing from zero at the surface to a maximum, and then decreasing to zero as ambient surrounding conditions are reached. In contrast, the temperature t of the air decreases from the heated wall value t's to the surrounding air temperature. These temperature and velocity distributions are clearly interrelated, and the distances from the wall through which they exist are coincident because, when the temperature approaches that of the surrounding air, the density difference causing the upward flow approaches zero. When air is blown across a heated surface, forced convection results. Although the natural convection forces are still present in this latter case, they are clearly negligible compared with the imposed forces. The process of energy transfer from the heated surface to the air is not, however, different from that described for natural convection. The major distinguishing feature is that the maximum fluid velocity is at the outer edge of the boundary layer. This difference in velocity profile and the higher velocities provide more fluid near the surface to carry along the heat conducted normal to the surface. Consequently, boundary layers are very thin. Convection heat transfer which occurs during high-speed flight or high-velocity flow over a surface is known as aerodynamic heating. This heating effect results from the conversion of the kinetic energy of the fluid as it approaches a body to internal energy as it is slowed down next to the surface. In the case of a gas, its temperature increases, first, because of compression as it passes through a shock and approaches the stagnation region, and second, because of frictional dissipation of kinetic energy in the boundary layer along the surface. The phenomena of condensation and boiling are important phase-change processes involving heat release or absorption. Because vapor and liquid movement are present, the energy transfer is basically by convection. Local and average heat-transfer coefficients are determined and used in the Newton cooling-law equation for calculating heat rates which include the effects of the latent heat of vaporization. (kŏn-vek -shŏn) A process of heat transfer in which energy is transported from one region of a fluid to another by the flow of hot matter in bulk into cooler regions. See also convective zone; energy transport. in the atmosphere, vertical movements of air masses caused by the force of buoyancy: air that is warmer and, consequently, less dense than its surroundings shifts upward, while colder, denser air moves downward. Weakly developed convection is chaotic and turbulent. When fully developed, ascending and descending air currents occur over particular areas of the earth’s surface and break through the atmosphere, sometimes reaching the stratosphere. The vertical speed of ascending currents (thermals) of this sort is usually on the order of several m/sec but may sometimes exceed 20–30 m/sec. Penetrating convection is usually associated with the formation of convection clouds: cumulus and cumulonimbus (storm clouds). The development of convection depends on the temperature distribution in the atmosphere by altitude. Ascending air rises as long as its temperature is higher than the temperature of the surrounding air. Likewise, descending air falls as long as it is colder than the surrounding air. Because of expansion, however, ascending air cools 1°C for every 100 m of rise (until condensation begins). This is called the dry adiabatic gradient. After the beginning of condensation (cloud formation), which is accompanied by the release of latent heat, the air cools by varying amounts in the range of several tenths of a degree for every 100 m of rise (the wet adiabatic gradient). To maintain convection, therefore, the vertical temperature gradient in the atmospheric column must be greater than the dry adiabatic gradient until the level at which condensation begins and greater than the wet adiabatic gradient above this level; in other words, the atmosphere must have unstable stratification. Such conditions occur during the summer in the air above warmed land masses and at all seasons in air moving from a colder to a warmer surface. Layers with low vertical temperature gradients, especially with temperature inversions, are inhibiting layers for convection. Matveev, L. T. Osnovy obshchei meteorologii. Leningrad, 1965. Shmeter, S. M. Fizika konvektivnykh oblakov. Leningrad, 1972.
in the ocean, vertical movement of water caused by change in its density as a result of change in temperature or salinity. If the density of the water is uniform on the horizontal and increases with depth, the water is in equilibrium. If this is not the case, the more dense water begins to descend to a depth at which the density of the descending water becomes equal to the density of the surrounding water. Convection leads to mixing and evening out of the physical and chemical characteristics of the water on the vertical and to enrichment of lower-lying layers with oxygen. In areas near the ocean floor (in particular, in deep-water troughs) there may be cases of a decrease in density with depth—for example, as a result of geothermal heat flow from the earth’s interior. In some cases this decrease in density with depth is accompanied by convection that encompasses a considerable layer of water near the floor (on the order of several hundred meters on the vertical). Convection during autumn-winter cooling (the winter vertical circulation) plays an important part in the regime of the ocean because during this period convection extends to great depths, even to the bottom in certain subtropical and tropical seas with high levels of salinity (Mediterranean Sea, Red Sea, and Persian Gulf). The climate of coastal land areas is moderated, since warmer water continuously rises to the surface from the depths in the ocean during the winter owing to convection. the transfer of heat in fluids, gases, or free-flowing media by means of the flow of matter. There are two types of convection: natural, or free, and forced. Natural convection arises with the nonuniform heating (heating from below) of fluid or loose substances in a gravitational field (or in an accelerating system). The more a substance is heated, the lower is its density, and the force of buoyancy FB causes it to move relative to the cooler substance. The force FB = Δ p. V (Δp is the difference in density of the heated substance and the surrounding medium; V is the volume of the heated substance). The direction of the force FE and, therefore, of the convection for the heated volume of a substance is opposite to that of the force of gravity. Convection brings about an equalization of temperature in a substance. When heat is supplied steadily to a substance, steady convection currents are set up in it that transfer the heat from the warmer layers to the cooler ones. As the temperature difference between layers is diminished, the intensity of convection falls off. Convection is also weaker for high values of thermal conductivity and viscosity in the medium. Convection in an ionized gas, such as solar plasma, is strongly affected by a magnetic field and by the state of the gas (for example, degree of ionization). Natural convection is impossible under weightless conditions. With forced convection, the movement of a substance occurs chiefly as a result of the action of a device such as a pump or stirrer. The rate of heat transfer depends not only on the factors mentioned in connection with natural convection but also on the speed of the forced motion. Convection is commonplace in nature: in the lower layer of the earth’s atmosphere, in the seas and oceans, in the earth’s interior, and on the sun (in a layer from the surface to a depth of about 20 or 30 percent of the radius). Fluids and gases are cooled and heated in various technical devices by means of convection. Diffusion in which the fluid as a whole is moving in the direction of diffusion. Also known as bulk flow. Atmospheric motions that are predominantly vertical, resulting in vertical transport and mixing of atmospheric properties. Movement and mixing of ocean water masses. Transmission of energy or mass by a medium involving movement of the medium itself. Natural convection is exemplified by the cooling of a vertical surface in a large quiescent body of air of temperature t∞. The lower-density air next to a hot vertical surface moves upward because of the buoyant force of the higher-density cool air farther away from the surface. At any arbitrary vertical location x, the actual variation of velocity u with distance y from the surface will be similar to that in the illustration b, increasing from zero at the surface to a maximum, and then decreasing to zero as ambient surrounding conditions are reached. In contrast, the temperature t of the air decreases from the heated wall value t's to the surrounding air temperature. 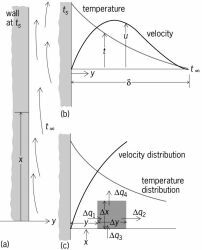 These temperature and velocity distributions are clearly interrelated, and the distances from the wall through which they exist are coincident because, when the temperature approaches that of the surrounding air, the density difference causing the upward flow approaches zero. The region in which these velocity and temperature changes occur is called the boundary layer. Because velocity and temperature gradients both approach zero at the outer edge, there will be no heat flow out of the boundary layer by conduction or convection. Heat convection in turbulent flow is interpreted similarly to that in laminar flow. Rates of heat transfer are higher for comparable velocities, however, because the fluctuating velocity components of the fluid in a turbulent flow stream provide a macroscopic exchange mechanism which greatly increases the transport of energy normal to the main flow direction. Because of the complexity of this type of flow, most of the information regarding heat transfer has been obtained experimentally. Heat transmission, either natural or forced (by means of a fan), by currents of air resulting from differences in density due to temperature differences in the heated space. In this way, a convecting gas cloud is formed over the upper part of the fountain, and this gas entrains the smallest pyroclasts so that they take part fully in the convective motion. The fire fountain in the vent now entrains so much atmospheric gas that it develops into a very strongly convecting eruption cloud in which the heat content of the pyroclasts is converted into the buoyancy of the entrained gas. Mars is the obvious place other than Earth to look for explosive eruption products: The low atmospheric pressure encourages explosive eruptions to occur, and the atmospheric density is high enough to allow convecting eruption clouds to form, at least up to [? Figure 6 shows the orientation fields at the end of filling at four different layers when a random orientation is imposed at the gate as an initial condition and the initial orientation state at the new element in the melt front is obtained by convecting the orientation state at each layer from the neighboring element. If true, then the two regions must remain essentially separate, maintaining two distinct convecting systems, says Jeanloz. Yet paleomagnetic studies show that mineral grains within highland rocks crystallized in the presence of a magnetic field; this indicates that the Moon likely had a molten, convecting iron core 3 1/2 to 4 billion years ago. Geoscientists believe the magnetic field arises from convecting currents of liquid iron within Earth's outer core. As an example, Stevenson focused on regions where slowly convecting mantle rocks hit the bottom of the core interface and spread out, resembling the spray pattern formed when a stream of water hits the bottom of a sink. In fact, some scientists have argued that the hotter and more vigorously convecting mantle would have kept the plates thinner at that time than they are today and would have certainly prevented a root from forming. If the mantle were divided into two separately convecting layers, the passage of heat from the lower to the upper mantle would be limited primarily to conduction. One model consistent with an abrupt cessation holds that the lower of two convecting layers in the mantle blocks the downward plunge of the subducted plate. How deep is an earthquake? Mathematically, the distance between these instabilities, and hence the size of the resulting convection cell, can be shown to measure a little more than twice the thickness of the convecting layer, regardless of the specific properties of the material.